Essentially, players take the role of (presumably 19 century European) chartered companies in order to exploit Africa, earning money and victory points as they do so. The blurb above takes great pains to explain that the game is not a historical simulation, so players are never directly enslaving and exploiting the African population, but it's a bit of a loaded theme. That's the reason I find it so interesting. There simply aren't many board games which are actively political in this way, unlike their (mostly indie) video game cousins. In contrast, those games might draw attention to the plight of the underprivileged or critique the world's dominant power structures, trying to have an impact beyond "just" being fun. Maybe the reason why board games don't really get into that is because of how they work - many board games play around with the social dynamics that come with their face-to-face nature. Most others are strategy games which require players to amass power from humble beginnings and seize victory from efficient use of resources. The nature of these strategy games lines up quite nicely with the typical idea of the "American Dream" and capitalism, the world's dominant socioeconomic structure. Games that almost simulate capitalism are, then, probably inherently bad at critiquing it. Otherwise, perhaps board game designers choose to be apolitical for commercial reasons, fearing backlash from possible buyers. Though Mombasa seems to be an outlier with its politicized theme, it turns out that designer Alexander Pfister had this kind of backlash in mind. He tried changing the cover of the game when many players reported thinking that the game was a historical simulation (hence the note in the rulebook's introduction specifically addressing the issue) after just seeing the cover. Pfister also sounded exasperated when we asked him about Mombasa's theme during a Skype interview, saying that "actually, I'm not interested in themes which would be a possible problem... I'm interested in games, in engine building, and all this stuff." For him, the theme of colonial exploitation was simply a neat way of tying the mechanics together into a coherent whole. And yet Pfister, currently living in Austria, is also clearly concerned about Europe's past with colonialism. Obviously that theme made it into the final shipped product, but he also wrote to us later that "a discussion about the ugly history of colonization can never be wrong. The worst thing we can do is to try to forget and repress." That attitude may end up slowly giving us the kinds of games that provoke exactly this kind of political discussion - see, for example, The Hen Commandments by the UK's Terror Bull Games, which was successfully Kickstarted last year (hat tip to Matt Lees of Shut Up And Sit Down for the reference). In the end it seems that Mombasa's approach is a carefully chosen middle ground between explicit politicization and apparent apathy. The rulebook blurb about the game's theme addresses the lack of cultural sensitivity that many gamers take issue with (remember Nintendo's Tomodachi Life fiasco? ), offering a chance for those who are truly interested to do additional research. At the same time, the game's mechanics are abstracted very far from the theme, and as Pfister told us, "I don't think [Mombasa] has much to do with colonization and I don't think it feels like it". This is a solid starting point, since it seems that the board game industry isn't yet ready for an influx of games that want to start these kinds of discussions. 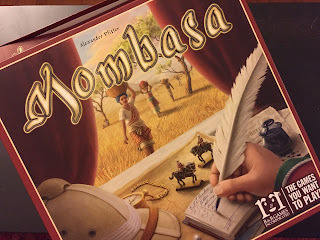 Until that day, keep your morality, gamers - Mombasa is a good eurogame and like most of them, its theme has nothing to do with how you actually play the game.